The Newstead Spinning Group was formed in 1978: yes…we are coming up to our 40th anniversary! That is pretty amazing for a small community group that began with a few keen spinners gathering in their own homes. Over the years people have come and gone and stayed. We now meet at the Newstead Community Centre each fortnight. Our aim is to bring together and support people who are interested in spinning and related crafts. 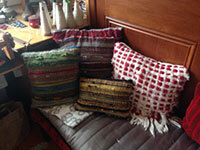 We work with a variety of fibres including wool, alpaca, mohair, silk, etc. Bringing together the process from fibre to the finished product includes cleaning and carding the fleece, perhaps dyeing with commercial or natural dyes, spinning or felting. 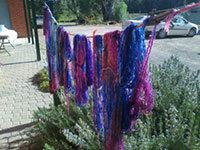 We create coloured yarns, knit, crochet and weave. This is always exciting and the outcomes often surprising and always lovely. We share our diverse skills, our latest projects and good company and are always open to learning new skills and techniques. On show ‘Fibre to Finished Product’: a collection of members’ creations: hanks and carded batts, to scarves, throws, beanies, hats, cushions, mittens, and more. 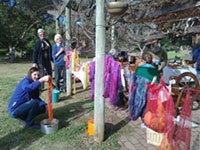 Demonstrations: carding, spinning, weaving, dyeing and felting (weather permitting). Dyeing and felting demonstrations will be on Tuesday 13th and 27th, our regular gathering days, at the Railway Arts Hub for September. Further information: please contact either of the following or talk to a current member.